I think this is one of the cutest children's books I have read! It teaches EVERYTHING about punctuation in a fun hands-on manner. It is a pop-up book and the students play around with commas by moving them in the book and a lot of other fun little pop-up activities. I will definitely have this book in my classroom. I might use it to introduce punctuation, but even for older grades I will have it in my classroom library or writing center for them to use whenever they need it. 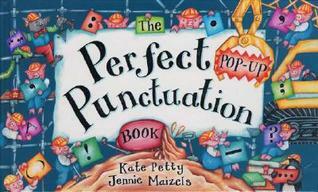 We use this hilarious pop-up book to introduce and review punctuation with struggling readers and writers. Some students even use it as a reference book. The pictures are funny and the examples are silly, which help breakdown the monotony of grammar study. Though made for younger children, older kids enjoy the comic relief of studying punctuation with this toy book. This is a great book to use when teaching students about punctuation. The book is full of interactive activities that the students can engage in! Around the class, I would have sentences strips of unpunctuated words and the student will go around the classroom and use the correct punctuation for the sentences.Grades 3-5. This is an interactive pop-up book which learning punctuation is displayed as fun! The sentences are incredibly entertaining and the students will recognize the correct use of every punctuation mark. This punctuation pop up book would be great for teachings students different punctuation marks. I say this because it’s a pop-up book which are always fun. This book will definitely teach students the different rules of using different punctuation marks. This is a great book for introducing emergent readers to the proper use of punctuations: when to use them; type of sentences denoted by various punctuations; and in creative writing lessons. This book has many interactive illustrations of proper punctuation. It would be a great addition to an early language arts classroom.